My Day Before Yesterday speaks vividly about the professions and labour of the people in it. Due to Letitia’s memoir being about her childhood and transition into adolescence, the majority of descriptions of labour come from the elders surrounding her. What is interesting about this memoir is the description of how her rather prosperous family plummets into austerity when her father dies. The result of the death is that her mother received the burden of having to run a business by herself. Letitia writes that, “Mum and I went directly to the post office, and with much heartache, she had to get me to sign the paper, to withdraw the ‘savings’ out, which my father had deposited for me.” By describing this act as “heartache,” Letitia demonstrates the extremes both her and her mother were pushed into at times of hardship. By doing this, Letitia’s chances of achievement in life, such as home ownership, were further limited due to her having less money behind her for, a deposit on a house for example. This also demonstrates the lack of social security for young widows and children in the pre-war period. Before the creation of the welfare state in the Atlee period, there were little benefits or support for those who did not work or were struggling to get by. The effect of this on Letitia is clear in this quotation as she refers to the desperation behind the act of the withdrawal of her savings. Carolyn Steedman argues, “class is a learned position at childhood, and often through exigencies of difficult […] lives.” Therefore, applying Steadman’s claim to Letitia’s experience of having to withdraw her money, Letitia learns the torment and hardship of being a member of the working-class, in particular, the female working-class, and, as Steedman points out, she learns this at childhood. The 5th Hunger march organised by the National Unemployed Worker’s Movement which left Glasgow on 22 January and reached Hyde Park on the 25 February 1934. 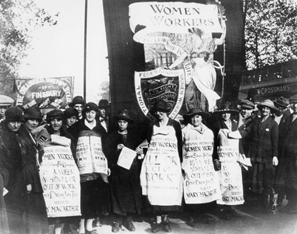 The women’s contingent included many textile workers. Letitia goes on to describe her mother’s grafting with; “It was terribly hard for her, running that business on her own, working all hours, and not having any time for leisure. The ‘Wine and Spirits’ license was always a worry to her, she used to lie awake at night, wondering how she was going to raise the money for it.” In the quotation, Letitia describes the effect of a widow trying to run a business whilst trying to make ends meet with little funds. By referring to her mother’s insomnia caused through austerity, Letitia emphasises how running a business single-handedly and being a widow is a tough and grafting job, resulting in all of her mother’s days being taken up with trying to earn money. Letitia also emphasises the mental health issues her mother is facing trying to run a business single-handedly. According to Letitia, the mental stress her mother was suffering was due to, not only the finances of the pub, but also due to money being owed to her from customers who had pursued to borrow money off her mother and her late father. What created the stress was, “most of them, having got the money, would stay out of the pub, making excuses to their friends, why they were no longer going in there.” Letitia claims that some of their excuses were damagingly fictional such as, “The beer isn’t up to standard.” The result of which was the loss of, not only their custom, but also people who would have become customers, as they would have heard that the beer was foul. This demonstrates the constant strain the business was facing due to customers taking advantage and how the possibility of financial ruin can mean the ruin of someone’s mental health. As Letitia mentioned earlier, her mother works all day without any breaks and together with her lack of sleep it would certainly lead to exhaustion. Bourke, Joanna. Working Class Cultures in Britain, 1890-1960: Gender, Class and Ethnicity (London: Routledge, 1994). Burnett, John. Plenty and Want: A Social History of Food in England from 1815 to the Present Day. London: Routledge, 1989. Gagnier, Regenia. ‘Working-Class Autobiography, Subjectivity, and Gender.’ Victorian Studies 30.3 (1987): 335-363 http://www.jstor.org/stable/3828397 (Links to an external site. )Links to an external site. Sherwood, M. E. W. “English Landladies.” The Aldine, vol. 7, no. 9, 1874, pp. 173–174. JSTOR, www.jstor.org/stable/20636851. “Reforming the Working Man.” Pubs and Patriots: The Drink Crisis in Britain during World War One, by Robert Duncan, NED – New edition, 1, 1 ed., Liverpool University Press, 2013, pp. 166–180. JSTOR, www.jstor.org/stable/j.ctt18mbcgs.12. Rose, Jonathan, ‘Rereading the English Common Reader: A Preface to a History of Audiences.’ Journal of the History of Ideas. 1 (1992): 47-70 http://www.jstor.org/stable/2709910 (Links to an external site. )Links to an external site. Vincent, David. ‘Love and Death and the Nineteenth-Century Working Class.’ Social History, 5.2 (1980): 223-247 http://www.jstor.org/stable/4284976 (Links to an external site. )Links to an external site.